So here's my rhetorical question, probably directed more at myself than at you, but you can consider it too if you like: why do I/we keep perpetuating the normalized idea we have of Jesus? I'm know I'm not the only one who's thinking this, but over time "the Church" has caused most everything about Jesus to become normal. I go to this place called Harvest House on Wednesday mornings and do a bible study. They provide low income housing to people, serve meals and hook people up with programs to help them out when they're down and out (among many other things). Sounds like a place Jesus hung out. The last two weeks I talked about how Jesus shows up in unexpected ways, (i.e. 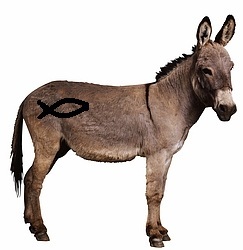 John 12, triumphal entry on a donkey) and does unexpected things (i.e. John 13, was his friends dirty feet). The Holy Spirit was most definitely at work; people asking great questions about Jesus, sharing stories about God in their life, sharing doubts and fears. I left believing God is really changing people's heart there; super encouraged. But that experience is not the norm. The normalized version of Jesus that I live with involves a bunch of time spent organizing services and events where people come and sit and leave seemingly unchanged. Now I don't know if they are really unchanged, in fact I don't know if you can hear truth about Jesus and be unchanged. But there is often very little evidence, sometimes no response to Jesus. That must mean we're missing something. I heard Jason Upton say once, "God doesn't want 3 slick songs and message, He doesn't want 3 not so slick songs and message either." That is resounding more and more with me. Has Church become so normalized that Jesus just gets on his donkey and keeps trucking right by us. In John 12 it says that a great crowd came out to see Jesus, because they'd heard about what he'd done. They came shouting Hosanna (Save) and celebrating Him as King. The disciples didn't get it. What if we're like the disciples. We meet on Sundays, and do our normal thing that people have been doing for several hundred years with different style and tempo, but it's pretty much the same and we don't get it. We scratch our head and wonder why people aren't flocking out to see Jesus. Maybe he's down the road on his donkey? Here's the other thing, if he is down the road on his donkey, I'll bet he's not doing something "normal" like handing out tracts, or putting a fish on his donkey's bumper or organizing a hymn sing. There's nothing wrong with those things but Jesus seems to be doing things like washing peoples feet (weird), showing prostitutes the kingdom (scandalous) or telling religious people they're wrong about who they think God is (perilous). Why does Jesus have to go and do these crazy things? Why couldn't he just gather some 'good' people together on Sunday for 3 slick songs and message? That sure would make my life easier... and boring. I can't imagine why people aren't signing up to be part of this (sarcasm in case you missed it).